From 2012 to 2016, the median home in the U.S. increased in value by roughly $33,000, from $172,000 to $205,000. That is great news for all the homeowners in the country. However those home investment returns have not been spread uniformly across the country. Some cities are experiencing faster than average home value growth due to the number of new residents moving to a city outpacing the number of new homes. This puts upward pressure on home values and mortgage costs. In order to rank the fastest rising housing markets in the U.S., we looked at three different factors. We looked at the 5-year difference between population growth and housing growth, 5-year home value change and 5-year median household income change. Check out our data and methodology below to see where we got our data and how we created our final index. 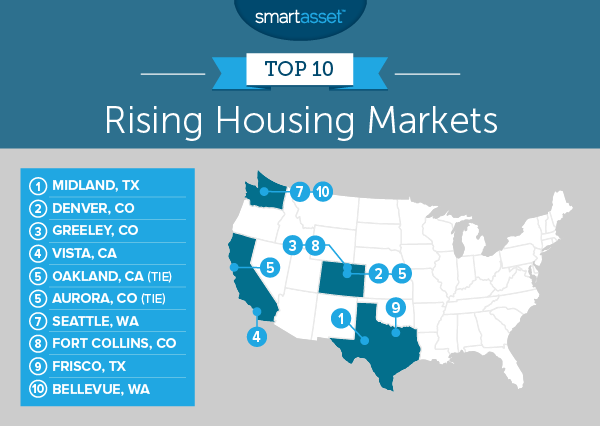 The boom continues – Four of last year’s top 10 rising housing markets appeared in this year’s top 10. Washington, D.C., Austin and Odessa, Texas which were in last year’s top 10 but fell out this year didn’t fall far. Each of those cities ranks in the top 15. 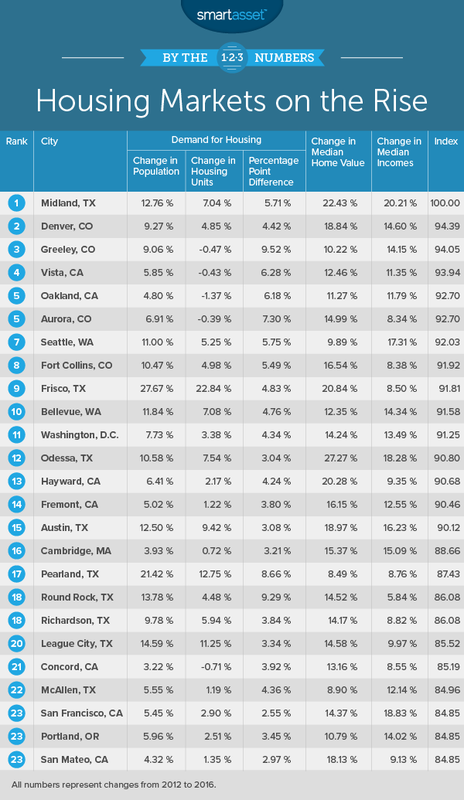 Colorado is rising the fastest – Colorado contains four cities in our top 10: Denver, Greeley, Aurora and Fort Collins. Other Colorado cities in the top 50 include Boulder, Westminster, Thornton, Arvada and Centennial. This is our second annual study of the top 10 rising housing markets. Check out the 2017 analysis here. For the second year in a row, Midland takes the top spot as the fastest-rising housing market in the nation, according to Census Bureau data. In the past five years we estimate that the median home saw its value increase by 22%, the fourth-fastest home value increase in our data set. That home value increase is roughly in line with the growth in income for households in this city. The average household in Midland went from an annual income of $59,500 in 2012 to an annual income of $71,500 in 2016, a 20% increase. For that metric, Midland ranks first. Denver holds onto its second-place ranking in this study. From 2012 to 2016, home values in this city increased by 19%, the 12th-fastest increase the country. But home values are not rising in a vacuum. While home values were rising so were incomes. The average household in the Mile High City earns 15% more in 2016 than they did in 2012. At the same time there is still upward pressure on housing prices due to sheer demand. From 2012 to 2016, the population growth outpaced housing stock growth by 4%. There seems to be something of a housing stock shortage in Greeley, Colorado. According to our analysis, the population in this Colorado city grew by over 9% from 2012 to 2016. At the same time, the housing stock remained relatively constant. That leaves a lot of new people looking for housing without any new homes to buy. That has in part led to a 10% increase in median home values over the same time period. Vista, California takes fourth. This city has above-average scores in all of our metrics. The leading factor for why Vista ranks so highly is its population. From 2012 to 2016 the number of people living in Vista grew by about 6%. Over that same time period, the total housing stock stayed constant. That means there are roughly 15,000 new residents in Vista with no new homes to move in to. Home values are also rising. From 2012 to 2016 the median home’s value grew by 12%. Oakland takes fifth thanks to rising incomes and rising populations. From 2012 to 2016, the number of new residents in Oakland outgrew the number of new homes by 6%. At the same time residents here are also able to afford more homes thanks to rising incomes. From 2012 to 2016 the median household income in this city grew by 12%, the 21st-fastest rate. Another Colorado city comes in tied for fifth. From 2012 to 2016 Aurora saw a pretty sharp increase in residents without a subsequent housing boom to give them somewhere to live. Overall the number of new residents in the city outgrew the number of new homes by 7%. That means more demand for housing without any increase in the supply. Over that same period home values increased by an impressive 15%. There is no doubt you need to be fairly well-off to afford living in Seattle. In a previous analysis we estimated you needed to earn $86,800 to afford fair market rent for the average two-bedroom apartment in Seattle. That number should continue to rise as more and more people, especially millennials, come to Seattle for jobs. According to our data, the population of Seattle grew by 11% from 2012 to 2016 while the housing stock only grew by 5%. Seattle households will have no trouble bidding up the price of homes either. From 2012 to 2016, the median household income in this city grew by 17%, the fifth-highest rate in our study. Fort Collins is another repeat top 10 finisher in this study. This city saw considerable home value growth from 2012 to 2016. In 2012 the median home in Fort Collins was worth $244,900, by 2016 the median home was worth $285,400. That is equivalent to a percent increase of 17%. Only 16 cities saw home values increase by more than that in our study. 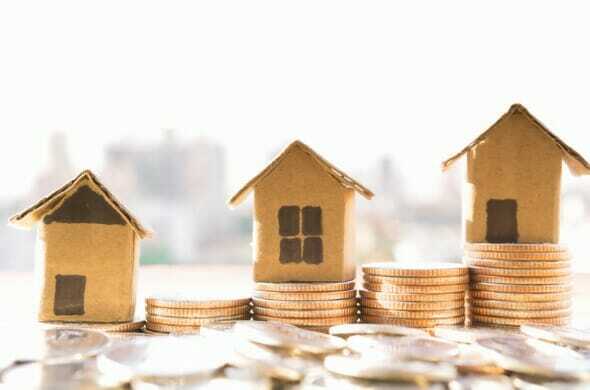 At the same time we can expect those home values to face further upward pressure as the number of new residents increases faster than new homes are being built. From 2012 to 2016, the number of new residents in Fort Collins grew by 5% faster than new housing was constructed. Frisco is something of a boomtown. From 2012 to 2016, the number of new residents grew by nearly 28%. Over that same time period the city increased its housing stock by 23%. However that still leaves a 5% gap between new residents and new homes. This has meant competition for homes has been fierce. From 2012 to 2016 the value of the median home increased by 21%. Bellevue, Washington wraps our top 10. This city scored in the top 20% of cities for all of our metrics. In particular the income growth in this city was impressive. From 2012 to 2016, the median household’s income grew by 14%. At the same time population outgrew new homes by 5% and the median home’s value grew by 12%. Housing demand. This is the percentage point difference between population growth and housing stock growth from 2012 to 2016. Home value growth. This is the percent change in median home values from 2012 to 2016. Income growth. The is the percent change in median household income from 2012 to 2016. Data for all metrics comes from the Census Bureau’s 2012 American Community Survey and the Census Bureau’s 2016 American Community Survey. First, we ranked each city in each metric. Then we found each city’s average ranking giving equal weight to all metrics. Using this average ranking we created our final index. The city with the best average ranking received a 100 and the city with the lowest average ranking received a 0. Start saving early – When you are going to buy your home you will need a down payment of at least 20%. For some workers in some housing markets, hitting the 20% threshold won’t be difficult. But for many Americans accumulating a down payment of 20% takes many years of saving. In order to maintain flexibility it is a good idea to start saving a few years in advance of when you expect to buy a home. Pay attention to all the costs of owning a home – For renters, the costs of renting are pretty straightforward. Usually there is just rent and then utilities. For homeowners there are different costs to be aware of. First of all, there is the mortgage which makes up the bulk of housing costs for homeowners, but then there are also property taxes and homeowners insurance. In some states like Texas or New Jersey, property taxes can be significant. And don’t forget home repairs. As a homeowner you are responsible for the upkeep of your home whereas renters are not. Don’t get into a bidding war – When you are shopping for a new home, it’s a good idea to figure out how much house you can afford ahead of time. This will stop you from chasing after a dream home that might be just a little outside your affordability range. With that in mind if you find yourself getting into a bidding war and the price is creeping above where you are comfortable, back out. It is not worth buying the home of your dreams if you have to sell it after a few years when you find out you can’t afford it.